"Your pathetic powers are no match for mine!" Arch-Curate Vyrthur is a Snow Elf vampire found in the Forgotten Vale. He is the brother of Knight-Paladin Gelebor and the only other uncorrupted Snow Elf. He created the prophecy which Lord Harkon is chasing in the Dawnguard questline, after having been forsaken to vampirism by Auri-El. He sought revenge through the corruption of Auri-El's influence on Nirn—his bow—which would have been achieved by dowsing the artifact in the blood of a Daughter of Coldharbour, a being of the purest evil in Tamriel. He wears a set of ancient Falmer armor, including boots, cuirass, and gauntlets. He carries an Elven Dagger of Blizzards, as well as some random gems and potions. He knows a number of spells, namely Drain Life, Conjure Frost Atronach, Vampiric Invisibility, Lightning Bolt, Ice Storm, Icy Spear, Frost Cloak, Banish Daedra, and Command Daedra. During the quest Touching the Sky, Gelebor asks you to kill Vyrthur in exchange for Auriel's Bow. He is found sitting on a throne in Auriel's Chapel. As you approach he will begin to speak to you about Serana. "Did you really come here expecting to claim Auriel's Bow? You've done exactly as I predicted and brought your fetching companion to me. Which, I'm sorry to say, means your usefulness is at an end!" He will then release the Frozen Chaurus to attack you. After defeating them he will say "An impressive display, but a wasted effort. You delay nothing but your own deaths!" He will then use his power to pull down the ceiling and release half the Frozen Falmer to attack you: "Finish them!" After defeating the Frozen Falmer, the now angry Vyrthur will say "This has gone on long enough." as he summons an Ancient Frost Atronach and releases the rest of the Frozen Falmer. During the fight Serana remarks that his life will end here, however he merely replies "Child, my life ended long before you were born!" After defeating the Falmer and atronach, a now fearful Vyrthur will say "No... I won't let you ruin centuries of preparations..." When Serana tells him to surrender and hand over the bow he will say "Death first!" He will then use all his power to destroy Auriel's Chapel with you inside and run outside to the Temple Balcony. Exhausted from using all of his power he will begin to talk to Serana, allowing him time to recover. Serana: "Enough, Vyrthur. Give us the bow!" Vyrthur: "How dare you. I was the Arch-Curate of Auri-El, girl. I had the ears of a god!" Serana: "Until the "Betrayed" corrupted you. Yes, yes. We've heard this sad story." Vyrthur: "Gelebor and his kind are easily manipulated fools. Look into my eyes, Serana. You tell me what I am." Serana: "You're... you're a vampire? But Auriel should have protected you..."
Vyrthur: "The moment I was infected by one of my own Initiates, Auri-El turned his back on me. I swore I'd have my revenge, no matter what the cost." Serana: "You want to take revenge... on a god?" Vyrthur: "Auri-El himself may have been beyond my reach, but his influence on our world wasn't. All I needed was the blood of a vampire and his own weapon, Auriel's Bow." Serana: "The blood of a vampire... Auriel's Bow... It... it was you? You created that prophecy?" Vyrthur: "A prophecy that lacked a single, final ingredient... the blood of a pure vampire. The blood of a Daughter of Coldharbour." Serana: "You were waiting... all this time for someone with my blood to come along. Well, too bad for you... I intend on keeping it. Let's see if your blood has any power to it!" Recovering enough to resume the fight he will once again attack. As you kill him, his final words will be "Farewell." or "Auri-El, forgive me..."
Attacking an enemy "Her blood will be mine!" "You're no match for me!" "You can't stop the inevitable!" "I'll scatter your ashes myself"
"Die, damn it... die!" "I'll stain the ground with your blood!" "The prophecy's end approaches!" "You have no dominion here!" "I'll darken the skies with her blood!" "Your suffering will be legendary!" Defeating an enemy "I'll feed your corpse to the Betrayed." Detecting an enemy "Show yourself." "This is pointless." Engaging an enemy "Come and face your destruction!" Giving up the search "Craven fool. This isn't over." "Hide if you wish, it matters little to me." Looking for an enemy "This is a waste of time." "I'll find you yet, coward." Losing sight of an enemy "Run, coward! Run and never return!" "You only delay the inevitable." "Pitiful sorcery. You'll not stay hidden long." Spotting an enemy "There you are!" "This time, to the death!" Taunting an enemy "Centuries of prepration will not fall to ruin because of you!" "I will herald the fall of eternal night!" "Let twilight fall and blood spill!" "Your existence is meaningless!" In the game files, he is part of a newly created race known as SnowElfRace. It is largely based off of the High Elf race, and even bears the name "High Elf", but for all purposes Vyrthur can be considered to be a Snow Elf. Since Knight-Paladin Gelebor cannot be killed or pickpocketed, Vyrthur has the only set of Ancient Falmer Armor that the player can retrieve. 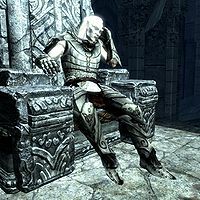 Despite being a vampire, Vyrthur is still susceptible to poisons, because he does not actually count as a vampire, as there is no separate Snow Elf vampire race. In the game files, he is called "Althadan Vyrthur". 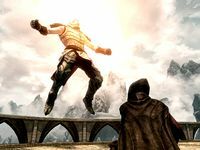 Once Serana drops him and he begins to fight, he can easily be shouted off the balcony where you confront him with Unrelenting Force. The fall kills him instantly, but you will have to go after his body to retrieve the armor. This page was last modified on 10 May 2017, at 03:14.